Medical School Loans is a leader in helping medical school students fulfill their education dreams and successfully prepare for their financial futures. We are committed to providing medical school students and graduates with the necessary tools for effectively managing your education loans and obtaining financial freedom. At Medical School Loans, our number one priority is serving your needs. We are dedicated to furnishing the information, products, and services you require, and we have a steadfast commitment to providing a superior level of customer service at all times. View current interest rates, learn about the many benefits of a federal consolidation loan, calculate monthly payments, and apply for a federal loan consolidation. Select the e-signature option to complete your application entirely online. View current interest rates and eligibility requirements, and apply for a private loan consolidation. Receive an answer within minutes of completing the application process. When you apply for a Medical School Loans Private Student Loan Consolidation, you'll get 30 days free access to HealthcareCrossing! That's a $29.95 value. 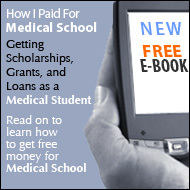 Browse through articles and press releases containing current information affecting you and your medical school loans. Also, use our financial management tools to increase your financial success. Medical School Loans is committed to assisting medical school students and health care professionals with the management of their student loans. In this endeavor, we have developed an information division aimed at financial aid professionals. We believe assisting financial aid professionals will get us closer to our goal of assisting students. It is the financial aid office, after all, that is the connection between education and financing the education. * The final fixed interest rate for your federal loan consolidation loan is calculated as the weighted average of the interest rates on the loans being consolidated rounded up to the nearest one-eighth of a percent. Your exact monthly payment reduction may vary depending on your loan. Medical School Loans Financial reserves the right to modify, expand or discontinue this offer at any time without notice.